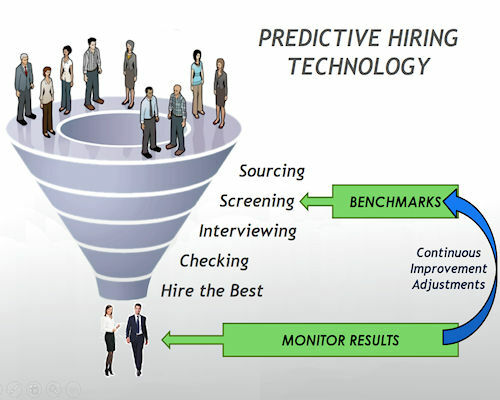 Grab our DIY guide to set up your own predictive hiring system, or use our software to really get serious about hiring the best. RecruitPack allows you to cherry pick “A-Player” candidates. Our unique user-friendly staff recruitment software practically eliminates costly mis-hires. Give yourself more time to focus on growing your organisation and spend less on your recruitment process. Our cloud based recruitment software helps you rapidly determine who will be the best fit for your company and who will add value and experience to your business. Applicant assessment and benchmarking systems built into the service quickly identify who has the right characteristics for the role and for your organisation. As your new hires raise the quality of your workforce, you can raise the bar with new benchmarks. Your job is so much easier when you select from candidates who are an ideal fit. Top talent produces results, without pressure, drama or headaches. Behavioural interview guides are tailored to each candidate’s responses in the application survey. RecruitPack has already identified the most-likely-to-be-successful candidates and now you can delve even deeper to learn how each one has performed in real life situations. “Xavier College is very pleased with our decision to use RecruitPack. The first thing we noticed was how quickly it was deployed and how easy it was to learn and use. Then there was the immense time saving generated by moving to an online system equipped with assessment, communication and tracking tools and everything recorded in one central database. You’ll save time and find better qualified candidates who are a fit for your company. Reduce turnover, increase productivity, save money—all through one of Australia’s best online recruitment software options. If you rely on resumes, you may as well close your eyes and pick one. Our algorithm eliminates guesswork. You’ll only invest your time with the right people. You’ll slash your advertising budgets. Not only will you eliminate expense, you’ll need fewer candidates to find hires that are an ideal fit. Our built-in psychometric function surveys each applicant, compares them to your role-specific benchmark and ranks them. You’ll know in advance if they’re likely to succeed in the role. Our algorithm looks for the attitudes and interpersonal strategies required for any role you need to fill. You’ll only interview candidates likely to fit in with your corporate culture. Find applicants in Australia on our recruitment database whose attitudes and values fit with your business model and company culture. No more regrets about people whose work is acceptable, but who just aren’t a right fit. The time you’ll save lets you get more done. Spend less time on the parts of hiring that just aren’t fun, or easy. Achieve recognition for your ability to find the exact right people. RecruitPack is much more than just a powerful Applicant Tracking System that helps you cut down on the volume of applications you must sort through. 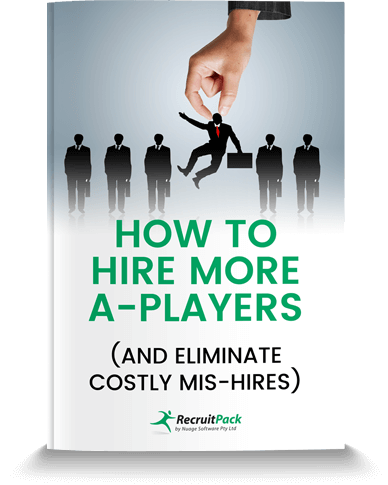 It is an expert system that aids you in the selection process by eliminating the uncertainty of identifying A-Player recruits. 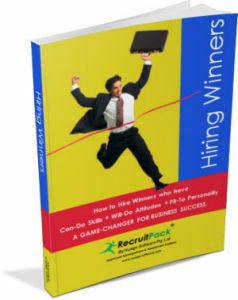 RecruitPack improves the calibre of people coming into your organisation. By ensuring you have a repeatable process to identify the very best candidates, you’ll raise the bar for everyone while increasing productivity and profits. You will no longer waste time on low-value tasks. The screening and assessment tools on this staff recruitment software allow you to pick the A Players in minutes allowing you to spend quality time with high-calibre candidates and secure them before your competitors do. This recruitment agency CRM provides tailored screening questions and psychometric tools that generate the material for targeted behavioural interviews and targeted reference checks, ensuring you avoid the frauds and only hire the best. © Copyright RecruitPack 2018, All Rights Reserved. Almost there – please complete this form to get instant access to the report. Almost there – please complete this form to get instant access to the eBook. Almost there – please provide your contact details. We will call to arrange a time for the review.